Won a $50 Gamestop gift card, a TFG Fight Club Membership for 1 year, and a personalized artwork from TFG's Featured Artist, Jet3000! Jet will draw any two fighting game characters of your choice (on one page) and you will receive a professionally framed copy of the artwork! Won a $25 credit at the TFG Shop and a TFG Fight Club Membership for 1 year! Won a $10 Gamestop gift card and a TFG Fight Club Membership for 6 months! 1. Banners should be no bigger than 600 X 250 pixels! Other than that, any size or shape is acceptable! Remember, smaller and sleeker = better. 2. Banners can simply read "The Fighter's Generation and/or TFG" or be themed after any of TFG's sections such as "News, Characters, Features, Feedback, Shop, etc." 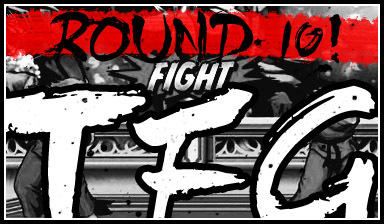 Using the the text "TFG" and/or "The Fighter's Generation" is promoted if you create a banner for one of TFG's sections but not required. Also feel free to include the website address on any banner... "FightersGeneration.com". 3. Animated banners are also acceptable (if you have the skills)! Just keep the animations relatively short & sweet... and of course, original. 4. The theme of this year's contest will be TFG's upcoming 10 year anniversary!!! In November of 2000, TFG's humble beginnings were seen on a little web address known as Gamegen.com (which some of you might remember). 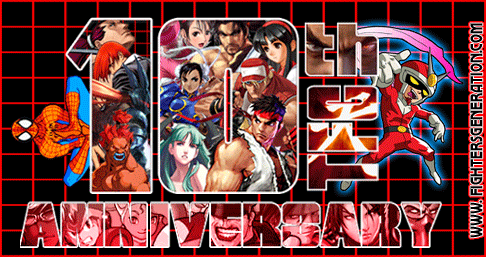 So for this year's contest, feel free to proudly display the likes of "10 Year Anniversary" or "Celebrating 10 Years Online" on your banner! 5. There is no limit to how many banners you can enter into the contest. Increase your chances of winning and create as many awesome banners as you can conjure up! Please email all banner entries to fightersgeneration@verizon.net. Your TFG Webmaster will be the ultimate judge of the contest (though I will be taking feedback from others), and will also be supplying the prizes (below)! Check out some other great entries from 2010!